Temprid FX must be applied with a pump sprayer, such as the Chapin 1 gallon pump sprayer. *To apply Advion Roach Bait Gel, removing the closed blue tip by gently unscrewing it, then replace it with one of the included reuseable open tips. Use the provided plastic plunger or a bait gun to dispense the gel. in corners and under railing n and on drawers. *For heavy infestations, apply 3 to 5 spots of bait per 10 linear feet. *For light to moderate infestations, apply 1 to 3 spots of bait per 10 linear feet. *For situations requiring treatments over several months, rotate your baits using our Roach Control Kit Rotation B and Roach Control Kit Rotation C.
Every room in my house was awful. Here it is only ONE WEEK after only getting out the Gentrol discs and HEAVILY baiting EVERY room...and guess what? I don't recognize this place! I haven't even gotten to use the Temprid yet! (I'm having issues coordinating my cats being out of the house) but I can roll into my kitchen AT NIGHT and only see maybe 10 baby ones and 7 adult ones and they are sluggish. I have cried I'm so happy! I never knew that $65 could make this much of a difference! I've spent thousands on store bought baits and the roaches were still winning, but NO MORE! The tide has turned! Also, the customer service is AMAZING on this site. They ACTUALLY help you even if you've never ordered before. They don't try to oversell you either...I originally was going to order two kits plus extra tubes and the lady talked with me a VERY long time, was SUPER knowledgeable... I told her the square footage of my home (2,000) and she told me I would prolly have enough bait for two treatments. Now you do need to follow the directions for heavy infestation (5-7 drops per linear feet) on the bait, and replace as soon as they eat it up...the first day, we had to Reba it the kitchen 3 times. To let you fully understand, I have had professional extermination companies walk in, apologize and walk out saying they couldn't help me. I did my research, but I never dreamed that we could have gotten results this fast and with just the Gentrol and the Advion! Most of our infestation was German cockroaches. My pest control company which I had used since1996, told me that I had German roaches. They also kindly informed that my Pest Control service does not cover German roaches. They wanted to charge me $150 a month for 3 months minimum. And only would guarantee the German roaches would be gone for about 30 days. So I searched the internet, read several product reviews and I decided to buy this kit. I followed the instructions, which are very easy to follow. I had a severe infestation. The roaches were coming out during the daytime. It has been 10 days now and there have been several dead German roaches throughout my kitchen. This product is a very effective. 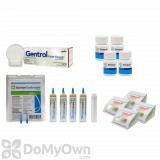 The three components in this kit kill the roaches and keep them from reproducing and thus from returning. I am very glad that I purchased it. I would highly recommend this to anyone. The rep I talked to pulled up my prior order from 2 years ago & gave excellent advice on which package to get. Do you have any other recommendations for roach control? Been spraying with Bengal for 3 days for roaches. Roach Control Kit Rotation C would be a great starting point for roach control. Roach Control Kit Rotation C contains the professional products you need for complete treatment in a home, apartment, or small commercial area. This kit includes the chemicals recommended to accompany Inspection and Prevention measures such as proper sanitation, elimination of food and water sources, and harborage elimination for complete Roach Treatment . Our Roach Control Kits also include Catchmaster 100i Insect Monitor glue boards to help monitor your infestation and treatment. Advion Roach Bait Gel has an attractive bait matrix and the unique active ingredient Indoxacarb to kill up to three generations of roaches in a single feeding. Gentrol Point Source Stations contain the Insect Growth Regulator hydroprene, which interrupts development and reproduction. Cyzmic CS is an insecticide concentrate with two powerful active ingredients, providing both a quick initial kill and long-lasting residual treatment. There are lots of positive reviews regarding the Advion Roach Bait Gel found in Roach Control Kit Rotation C. Is there any reason not to start out using that kit? No, there is no reason not to start with Roach Control Kit Rotation C versus Roach Control Kit Rotation Kit A. The main difference between the kits is the roach bait gel each one contains. It is recommended that you rotate the bait gel every so often because roaches can become immune to it over time. If you want to start out with Roach Control Kit Rotation C, just be sure to switch to either Roach Control Kit Rotation Kit A or Roach Control Kit Rotation B when it is time for more product. Do I do the steps in the Roach Control Kit all together or separately for treatment? There are several steps in this kit after sanitation, do I use the products one step at a time, for example, Bait, the Growth inhibitor, then spray, or All simultaneously? You would use each product in the Roach Control Kit in their respective areas at the same time. So to see the best results you would spray the Temprid along baseboards and crevices down low and behind and under large appliances like fridge and stove. Then you can place the Gentrol Point Source discs in areas of need like above/sides of upper cabinets and fridge as well as under the kitchen sink. Each disc will last 3 months and covers about 75 sq/ft so the average amount per kitchen is 3-6 discs. Then inside the cabinets you would use the gel in small green pea sized dabs in corners and crevices and around hinges and drawers. So essentially you use all products at the same time of application; you wouldnt use the bait this week and then the spray the next and then the IGR. How long after I use Roach Control Kit Rotation C should I rotate to the next kit with Vendetta or Maxforce bait? It's for a heavy infestation. I've applied 3 tubes of Advion over 15 day or so and they've eaten up all of it each time. Roach baits should be rotated every 3-4 months of use if treatments are still needed. You will continue to apply baits as long as there is activity. The best kit to start with the Roach Control Kit Rotation A which contains the fastest killing bait, Maxforce FC Magnum. What can I use for a roach infestation in my bathroom & bedroom? Will Advion Roach Bait Gel work for me? Advion Roach Bait Gel is a great option for roach control, but if the infestation is severe, we would recommend that you use one of our Roach Control Kits, so that you will have everything you need to completely eradicate the roaches. You may want to look over our Roach Control Guide for more tips and information on treating this pest.